Thursday morning, authorities captured 36-year-old Jose Luis Garcia, Jr. who shot a woman in his residence, presumably his partner, leaving her in immediate need of emergency medical assistance. Weslaco police responded to a suspicious person call and made contact with Garcia, who was arrested without further incident. 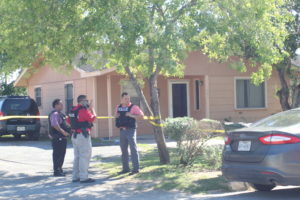 The shooting took place Wednesday morning, April 10, at approximately 8:22 a.m. on the 300 block of Jay Street in San Benito. The neighborhood is near South Sam Houston Boulevard and south of the expressway. Residents were advised by authorities to avoid the crime area. In a press release the morning following the shooting, SBPD confirmed that the woman was shot once in the face and several times in her body with a shotgun. The shotgun was found and recovered at the residence. SBPD also confirmed that the woman has undergone surgery and is in stable condition at the Intensive Care Unit. The Texas Department of Public Safety assisted the SBPD in search for the suspect as did Cameron County Constables, Texas Rangers, and Homeland Security Investigators. Officers on scene wore bullet proof vests, some heavily armed, while a helicopter patrol circled above San Benito neighborhoods. Has he always been a ROMANTIC? Ok Jk, but seriously! Why not just leave her, even if she cheated, or whatever dumb crap people do? Talk some “crap”, get it out your chest & LEAVE! Why THROW you life away over some BS?